This article is about the Honda engine. 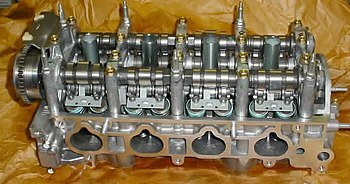 For the Rover engine series of the same name, see Rover K engine. For the Toyota engine series of the same name, see Toyota K engine. The Honda K-series engine is a line of four-cylinder four-stroke car engine introduced in 2001. The K-series engines are equipped with DOHC valvetrains and use roller rockers to reduce friction. The engines use a coil-on-plug, distributorless ignition system with a coil for each spark plug. This system forgoes the use of a conventional distributor-based ignition timing system in favor of a computer-controlled system that allows the ECU to control ignition timings based on various sensor inputs. The cylinders have cast iron sleeves similar to the B- and F-series engines, as opposed to the FRM cylinders found in the H- and newer F-series engines found only in the Honda S2000. Similar to B series, the K-series car engines have two short blocks with the same design; the only difference between them being the deck height. K20 uses the short block with a deck height of 212mm where K23 and K24 block has a deck height of 231.5mm. Two versions of the Honda i-VTEC system can be found on a K-series engine, and both versions can come with variable timing control (VTC) on the intake cam. The VTEC system on engines like the K20A3 only operate on the intake cam; at low rpm only one intake valve is fully opened, the other opening just slightly to create a swirl effect in the combustion chamber for improved fuel atomization. At high rpm, both intake valves open fully to improve engine breathing. In engines such as the K20A2 found in the Acura RSX Type-S, the VTEC system operates on both the intake and exhaust valves, allowing both to benefit from multiple cam profiles. A modified K24 engine is used in motorsports, such as Formula 3. See left for specific application. Chromoly flywheel, higher-tensile strength connecting rods, high-compression pistons, stiffer valve springs, higher-lift hollow camshafts with more duration, and 2007–2011 cylinder-head intake-port and exhaust-port surface polishing used in NSX-R. The JDM K20A type-R engine block would be removed from production assembly line by an experienced Honda engine technician to torque the connecting rod bolts to factory specification by hand using micrometer to measure connecting rod bolt stretching. Then the JDM K20A type-R engine block would be returned to the production assembly line to complete the engine building process. K20C1: First Honda Type R engine to be built in the USA at the Honda Anna Engine Plant in Anna, Ohio. ^ SAE BHP measurement changes from 2005 to 2006. Thus, reducing the 2006 Acura RSX Type-S rating from 210 hp (160 kW) to 201 hp (150 kW) on paper. ^ The RBC is not a variable-length intake. It has an aluminum block with an aluminum head. The K20Z3 has traditional performance VTEC cams on the intake and the exhaust cams. Variable valve timing technology is included on the intake but not the exhaust cams. The added valve timing control corresponds to the added "i" in i-VTEC. This version of the K engine uses a Mitsubishi TD04HL-15T turbocharger with a dual path turbine housing, optimizing low end response while allowing better high end flow. Maximum boost pressure is 13.5psi. The engine includes iVTEC and VTC technologies and comes mated to a version of Honda's 5-speed automatic with SH-AWD (note: SH-AWD was standard from 2007-2009 and optional from 2010-2012). ^ a b While in fuel efficiency mode. 4500 RPM in performance mode. [Please add accurate technical specifications] This section previously inaccurately suggested that the 2016-2017+ Acura ILX engine K24V7 and the K24W7 of the Acura TLX are the same engine, and although they may be very closely related, even sharing identical internal architecture and components, they actually are different engines with different Honda internal engine code designations. This may be strictly due to different transmissions, as the 2016-2017+ ILX uses its own specific 8-speed dual-clutch auto with a torque converter, as well as different exhaust, intake, and accessory packaging due to their differing chassis [the ILX sharing its basic architecture with the 2013 - 2016 generation Civic]. ^ "Honda K-Series Engines". JDM Spec Engines. Retrieved 20 May 2014. ^ "Technical Information RSX VTEC and VTC". Hondata. Retrieved 21 April 2018. ^ "Honda K20A 2.0l DOHC i-VTEC SPEC R Engine for the new FD2 CIVIC TYPE R". Asia.vtec.net. Retrieved 15 October 2018. ^ "Vehicle Specifications - 2018 Honda Civic Sedan - Honda Owners Site". Owners.honda.com. Retrieved 15 October 2018. ^ a b "2008 Acura TSX - Powertrain". acuranews.com. Retrieved 15 October 2018. ^ "Acura Set to Launch More Powerful, Technologically Advanced and Luxuriously Equipped 2016 Acura ILX Sport Sedan" (Press release). Los Angeles, CA: Acura. 20 November 2014. Retrieved 23 May 2016. ^ "2017 ILX Specifications & Features". Acura. 12 April 2016. Retrieved 23 May 2016. ^ "2009 Acura TSX - Powertrain" (Press release). Torrance, CA: Acura. 20 April 2008. Retrieved 1 September 2015.